...Green Legend Ran meets the most depressing parts of Blood Diamond. Shu is an average boy living an average life until one day a giant machine drags him through a time warp into a desert world torn by war. Trapped in the base of an insane dictator, surrounded by child soldiers, and seeking to help two girls--one with the mysterious power to create water, the other an accidental transplant from Shu's time--Shu must contend with war, slavery, and man's inhumanity against man just to survive. Now and Then, Here and There has for many distinguished itself as an instant classic, and at the very least I can say that it is a series not quite like any other. 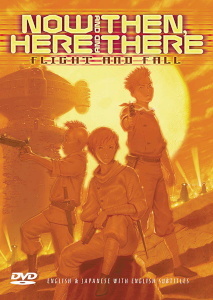 The set-up sounds similar to a lot of anime: A young boy gets accidentally sucked into a post-apocalyptic future world where he is caught up in a war and his own attempt to rescue a mysterious girl from the insane leader of a military cult. The look and feel, likewise, is not original--it reminds me very much of Green Legend Ran. But Now and Then, Here and There is something else entirely. It hits hard and fast with unrelenting, unflinching brutality, painting a picture of a military regime and its child soldiers that is both chilling and all too close to reality. Some of the scenes of uniformed boys in paramilitary training are frighteningly reminiscent of images on television only a few months after this series was completed, though they are more likely intended to parallel Japan's own practices during World War II. Thanks to the humanity and sheer force of will of its protagonist, it also stands out as a moving testament to the human spirit. Oh, and don't let Akitaroh Daichi's name on the project confuse you; the sort of perpetual-motion style of some of his other projects (Jubei-chan and Elf Princes Rane) may be evident, particularly in the opening episode, but the material is the polar opposite of his lighter series. Perhaps too grim and painfully violent for some, Now and Then, Here and There is nonetheless an undeniably powerful series as a result. Available in North America from US Manga Corps on three bilingual DVDs, or in a box set that includes an additional disc of extras. Was originally also available on three dubbed VHS volumes and a VHS box set, now out of print. Now and Then, Here and There is Copyright © 1999 2001 tarty - AIC / Pioneer LDC. Any images are the property of their respective rightsholders, and included for review purposes only under the fair-use clause of US copyright law.